1" thick, diamond polished acrylic blocks. Standalone or hang it. Large, custom and panoramic sizes available! Easy Online Ordering. Create Your Acrylic Block! Upload Photo. Choose Size & Options. 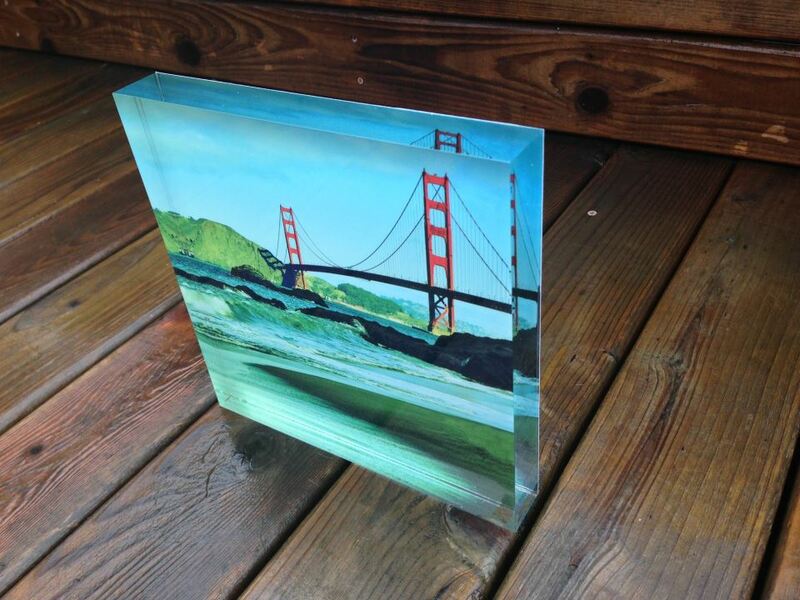 NEW ACRYLIC PHOTO BLOCK SIZES! 5x5, 6x4 and a panoramic 12x4. Order Here. Easy Online Ordering. Just Upload. Choose Size & Options. Checkout. Enjoy Art! 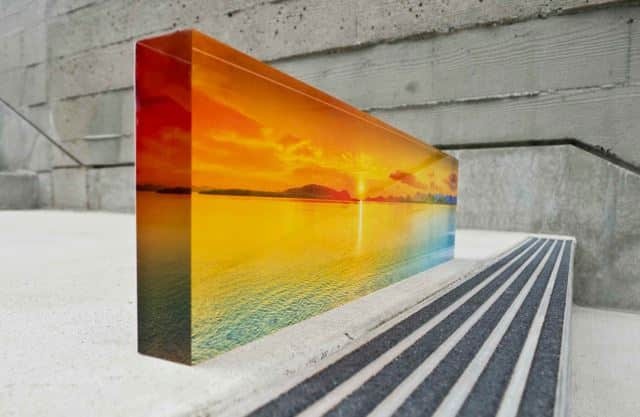 The sides of your 1" acrylic photo blocks are beautifully diamond polished to crystal clear perfection. 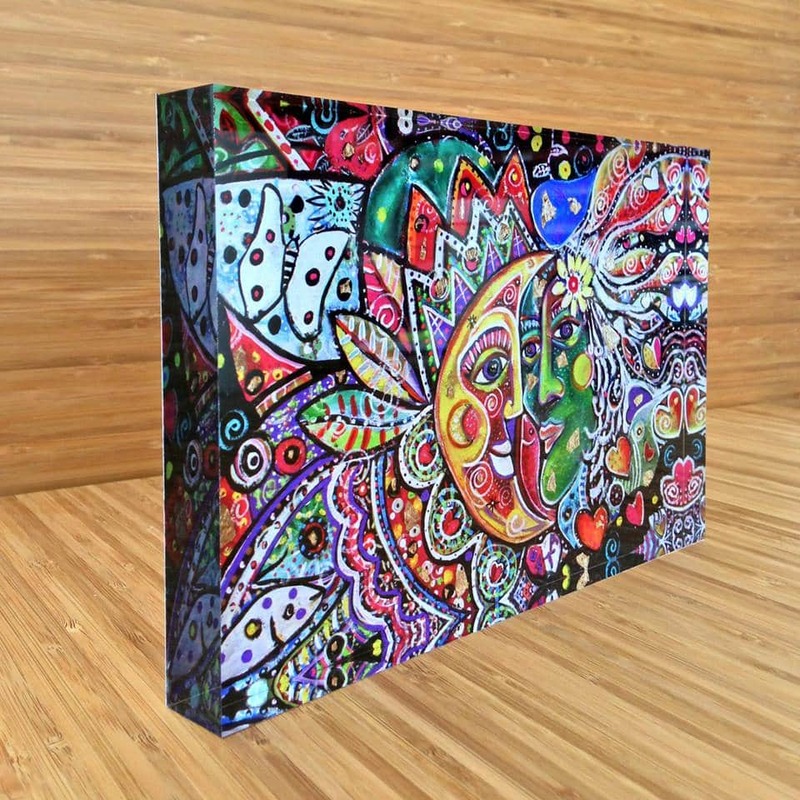 1" thick acrylic and diamond polished edges creates unparalleled vibrancy. The see through edges allow more light to refract within the acrylic, illuminating your image and creating a cool 3D effect. No Direct Printing. Superior Face Mount Method Used. Don't settle for direct to acrylic printing. The superior face mount method of printing to high grade paper (lustre or metallic) and adhering to the acrylic is superior both in terms of vibrancy, color accuracy and longevity. Free Standing Or Hang It. Your Choice! 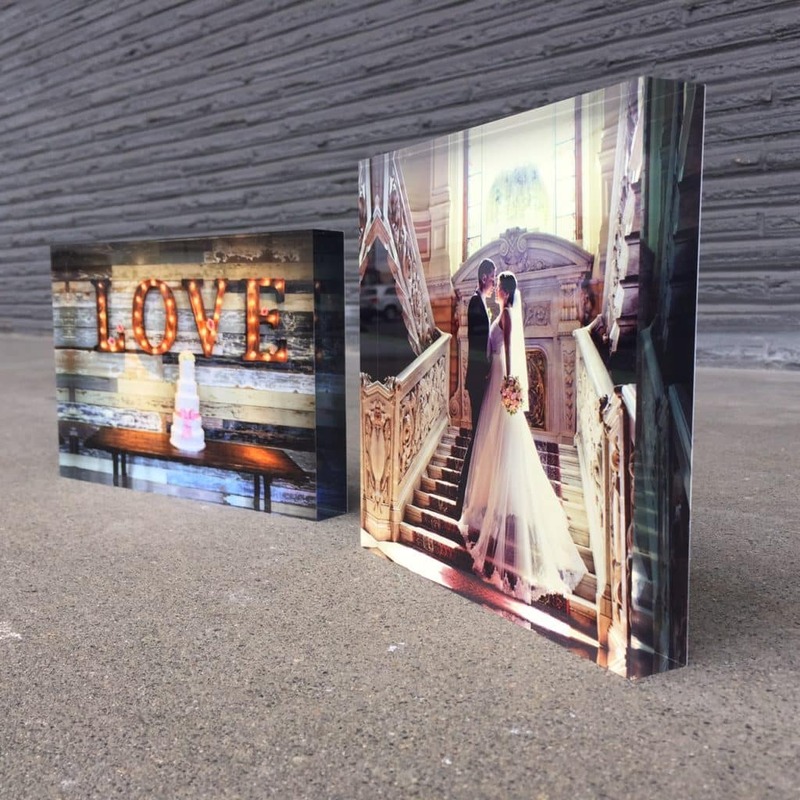 The 1" thick acrylic photo blocks stand on their own with no support required. If you want to hang them on your wall you won't find the option anywhere else but here! NEW! More Sizes. Larger Sizes You Won't Find Anywhere. 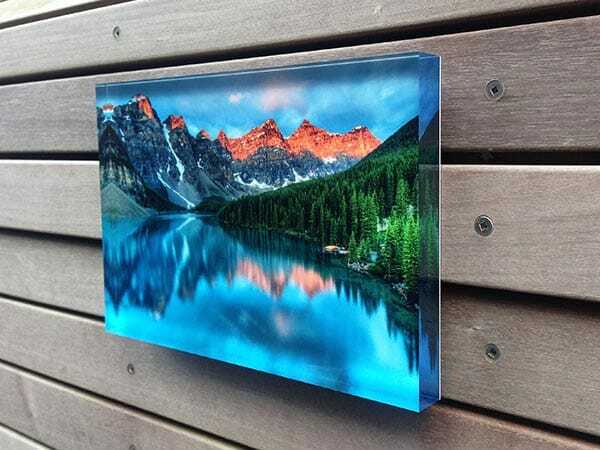 You won't find large acrylic photo blocks anywhere else! Now offering 15x15, 15x10, 18x12 and a new 20x6" pano size. We just launched a few smaller sizes too that include a 5x5, 6x4 and 12x4 pano. We can now also do any custom size up to 18x12 for you (offline). See all stocked sizes and prices in the Pricing section below. The carefully packaged blocks are small enough to ship affordably anywhere in the world. Only orders shipped within the US and Canada are available for online ordering. Every block is 100% handcrafted at our shop in Seattle. We never outsource. Stop by and say hi if you're local! Your acrylic block(s) will ship out within 4-5 business days and we have a rush option which gets your order out the door in 1-2 business days at a very reasonable rate. Expedited shipping options available as well. 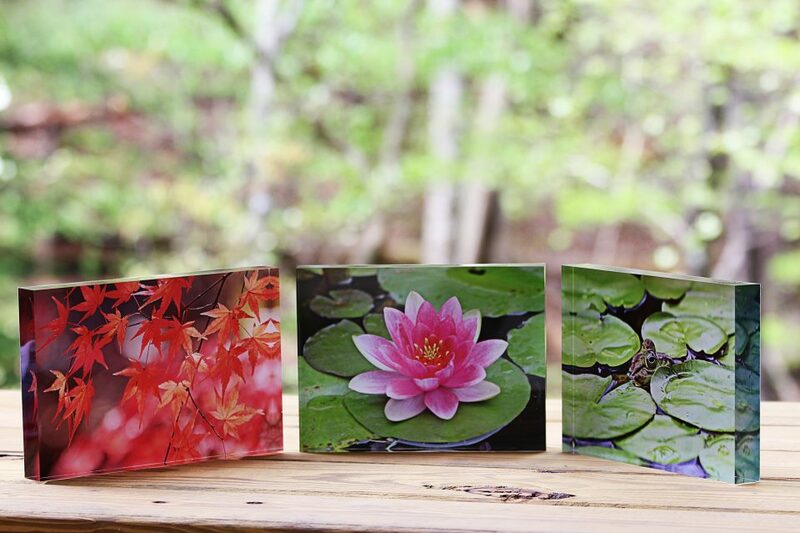 The 1" thick acrylic photo block product is the only product where custom sizes aren't available right away. You can see all the sizes we offer, the upgrade options available and the pricing of each in the pricing table in the tab to the left. We can do special custom size orders in the blocks, but we require 6 or more to be purchased and the lead time could be up to a month. The max size we can do is 20x15 and that is available for ordering. How should I clean the acrylic block? Most orders will take about two weeks to receive from time of payment. Rush options decrease that time. Standard: production time for stocked sizes that can be ordered online is typically 4-6 business days. For custom sizes it's about 7-8 business days. Depending on what we have in the order queue sometimes orders can get out a day or two faster. Rush: we offer a rush production option at checkout online which gets your order out in 24-48 hours for a 20% charge. We may not be able to do this for very large orders so please contact us before placing a large rush order. Standard: standard ground shipping is 1-5 business days depending on where you're located from Seattle. So for example, orders going to WA, OR and ID can be as quick as overnight while orders going to the East Coast will need 5 business days. Rush: we offer expedited shipping options if you need them, but they can get expensive. For online orders, you have the choice of 3 day, 2 day and standard overnight shipping. If you need a different option such as Saturday or AM delivery contact us before placing the order and we can send you a custom pay link. If you’d like a custom size we can do it, but it requires ordering 5 or more of that size and a longer lead time. Contact us for details. 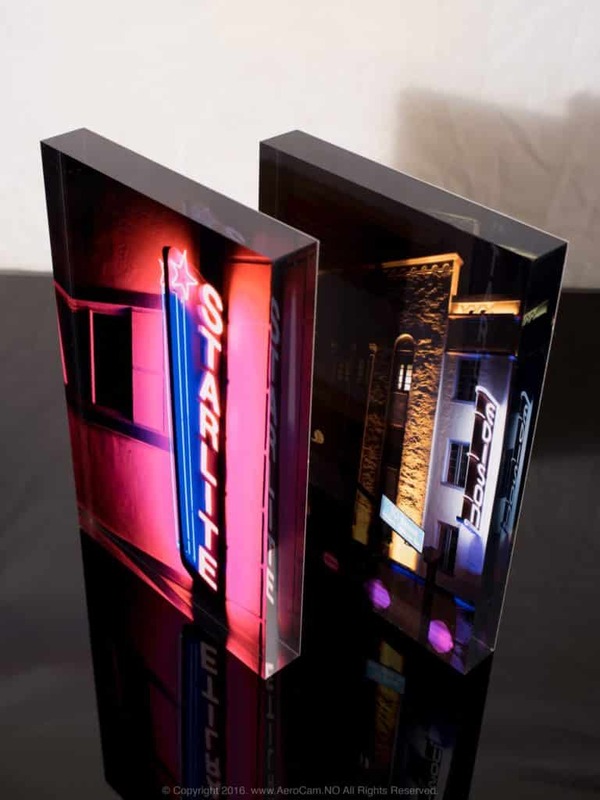 We offer a Diamond Jet Photolustre paper which is a very nice paper and included in the base price of all our products including the acrylic blocks. While it's a fine choice for any photo, the metallic paper upgrade (see below) is a terrific upgrade for many photos. The satin/lustre paper is typically recommended with photos where people are the focus (ie. family portraits) as well as softer, less vibrant images. Note: We are often asked to provide an image showing the difference between the two, but it's impossible to capture on a camera. If you're uncertain, contact us for a consultation and/or consider ordering a couple small paper proofs to see the difference. You may order a small paper only print here. If you want the option of hanging your block on the wall, you can choose that during the order configuration process. Aluminum/Cleat Hang System. 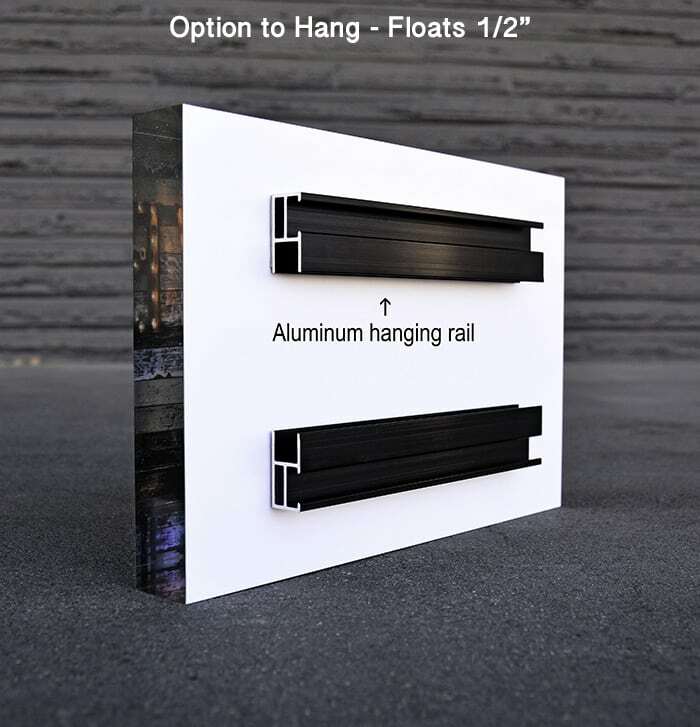 The aluminum cleat floats your acrylic block 1/2" from the wall and provides a highly secure french cleat hang system. Everything is provided to hang including screws and pre-drilled holes in the cleat for the wall. Some customers prefer to use a couple nails rather than adhering the cleat to the wall for easier hanging. This is fine for smaller blocks, but for larger blocks it's probably best to use the cleat. The standard ground shipping price is 10% of the product price with a minimum charge of $10. Shipping to AK, HI or Canada is 25% of product price + $10. Shipping anywhere else in the world is generally 35-50% of product price depending on size and location. Contact us for a quote. While we take great care in how we package your art, shipping damage can occur (quite rare). Each package is fully insured by us. If any damage occurs we replace it immediately. Just take a few pics of the box and the block. No need to send it back.